QUESTION: The drain line under my toilet, located in the common area under my floor, leaked into the unit below. Who is responsible for fixing the leak? (a) Unless otherwise provided in the declaration . . . the association is responsible for repairing, replacing, or maintaining the common areas, other than exclusive use common areas, and the owner of each separate interest is responsible for maintaining that separate interest and any exclusive use common area appurtenant to the separate interest. What is "exclusive use common area"? The illustration below will answer the question. Unit Improvements. 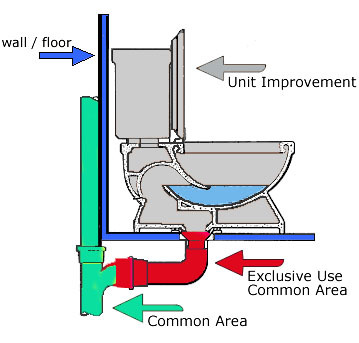 Plumbing fixtures, such as a toilet, are improvements to a condominium. In other words, toilets are contained within the air space of the unit, are part of the unit, and are owned by the owner of the condominium. Accordingly, the owner, not the association, is responsible for maintaining their toilets. If the float in the toilet tank gets stuck causing the toilet to overflow and damage the common areas, the association is responsible for repairing the common areas but the owner (or the owner's insurance company) is ultimately responsible for paying for the repairs. Common Area. The main drain line (in green) is common area because it services multiple units. This is the association's responsibility to maintain. The wall and floor (in blue) are also common areas that the association is responsible for maintaining. However, the finished surfaces on the walls and floors, such as paint, wallpaper, carpet, linoleum and tile, are the owner's responsibility to maintain. If the common areas are damaged, who pays for the damage after the association repairs the common areas ultimately depends on who caused the damage. Exclusive Use Common Area. The wax ring under the toilet and the drain line (in red) are "exclusive use common area" because they exclusively service the owner's toilet. As such, the owner is responsible (depending on your CC&Rs) for maintaining the wax ring and exclusive use drain line even though they are located in the common area. Unfortunately, many CC&Rs are silent when it comes to exclusive use common areas. RECOMMENDATION: So as to avoid conflict and costly litigation, associations should amend their CC&Rs to clearly define maintenance responsibilities for their exclusive use common areas. At a bare minimum, boards should adopt maintenance policies in their Rules and Regulations. Associations needing legal assistance can contact us. To stay current with issues affecting community associations, subscribe to the Davis-Stirling Newsletter.